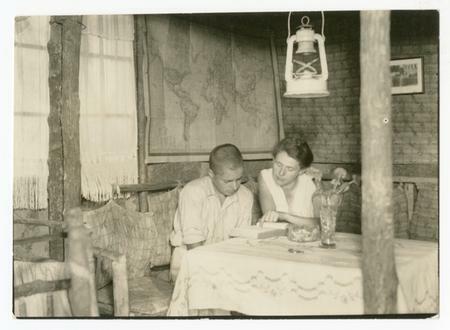 This is the third in a series of “murder mystery” posts about a 1930s Smithsonian scientific expedition, based on records in the Smithsonian Institution Archives’ collections. This is the third in a series of “murder mystery” posts, based on the Waldo Schmitt Papers in the Smithsonian Institution Archives’ collections. 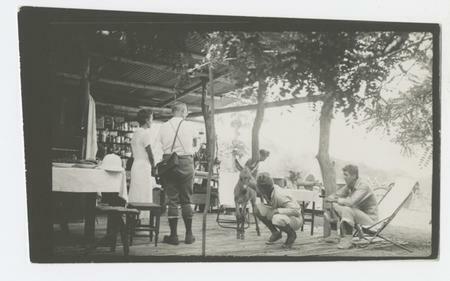 As a member of the Hancock Pacific-Galapagos Expeditions of 1933-1935, Schmitt had become acquainted with eccentric German colonists on Charles Island in the Galapagos. Among them were the polyandrous Baroness (AKA Eloise Bosquet de Wagner Wehrhorn), and two couples, the Ritters and the Wittmers. “[Ritter’s book] is of theosophical leanings, but it is the type of theosophical writing that no one cares to read after seeing the first page or two.” Waldo Schmitt, Waldo Schmitt Papers, Record Unit 7312 box 87. Dr. Friedrich Karl Ritter of Berlin was a dentist who longed for a retreat where he could indulge his raw food theories and complete his magnum opus, a philosophical theosophist treatise. 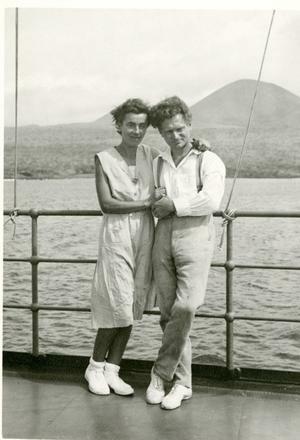 He was accompanied by his devoted disciple and girlfriend, Dore Koerwein, who was known to island visitors as Dore Ritter, although their respective spouses had been left in Germany with instructions to take care of each other. Dr. Ritter’s dentistry came in handy; while on the island he had had to extract most of Dore’s teeth. Unfortunately the two of them had only one pair of false teeth to share, and these were stainless steel—Dr. Ritter’s own invention. The Ritters quickly came to understand the challenges of living on remote Charles Island. When they arrived, they didn’t know that their land would be covered with thorn bushes and hardened lava flow. To plant a garden, the lava had to be broken up and carried away in buckets before arable soil could be hauled down from their hilltop spring. Dr. Ritter wistfully thought how nice it would have been had they thought to bring along a wheelbarrow. The couple also arrived expecting tortoises and iguanas, but not realizing that there were large mammals, such as cattle and pigs, on the island. Eighteenth century pirates had introduced goats; in the nineteenth century, the mainland government introduced dogs to control the goats. Earlier colonists left behind cattle, donkeys, cats, and pigs, and accidentally introduced rats, mice, and cockroaches. Hordes of feral animals greeted the Ritters, all eager to share the produce of their garden, and the Ritter’s defenses were a bird gun, rat poison, and dynamite. Their attempts to shoot, poison, and explode the wild hogs were unsuccessful, but in the end the dynamite made the hogs nervous enough to stay away. The Ritters found that the best way to protect their feet and legs from thorns and jagged rock was to wear hip boots—and the best way to cope with tropical heat was to wear only their hip boots. Visitors were encouraged to shout their presence at their front gate, and were welcomed by the sound of the Ritters scurrying away to get dressed. Thus began Charles Island’s reputation in the press as the nudist island. Smithsonian scientist Waldo Schmitt noted they weren’t really nudists because they went without clothes for practical reasons—not philosophical ones. In other words, they weren’t nudists—they were just naked. Ultimately, these two innocents from the arty crowd in Berlin carved a home and garden out of the wilderness. They reclaimed enough land from thorn scrub and lava slabs to build the house and garden they called “Eden,” The Ritters tamed cats and donkeys—as pets and to keep away vermin, and serve as beasts of burden. Dore’s pet donkey colt is in the foreground. The Ritters were nothing if not high-minded, and the sight of their fellow colonist, the Baroness (AKA Eloise Bosquet de Wagner Wehrhorn), traipsing around in French silk underwear with her two boyfriends was just too much. There was also jealousy provoked by the fact that they had written up their adventure for the Atlantic Monthly—but it was the Baroness who by virtue of her exotic lovelife captured the spotlight and reaped the rewards— gifts from wealthy American tourists. On his deathbed, Dr. Ritter would later speculate that he was being punished for thinking so often of killing the Baroness! "The nudism so widely touted in the papers is more or less a figment of the imagination. 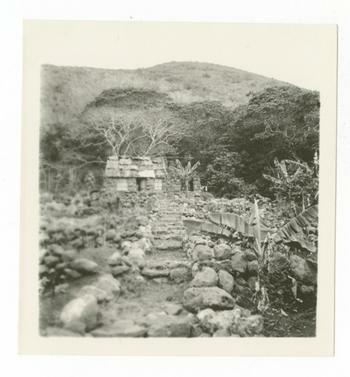 We have a picture of the only nudist on the island—the Wittmer infant…" Waldo Schmitt Papers, Record Unit 7312, box 87. The story of colonists Arthur and Margarete Wittmer is shorter. 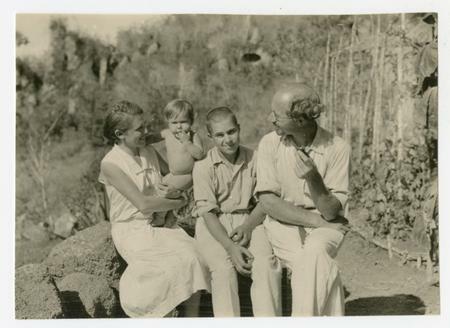 They were a happy, relatively ordinary couple who had come to the Island with their children to escape Germany’s post-war financial meltdown. In retrospect, the Wittmers come off like the stars of a television sitcom—normal people surrounded by a cast of Charles Island’s daffy supporting characters. [Wittmer’s] story is sadly commonplace... German office worker…then the war came and threw him into the trenches…then completely nerve broken when he returned. No job, but a small capital. The inflation took care of that. He tried everything, but nothing would succeed…Sitting here in the quiet room and going through the hard conditions after the war…in spite of the distance in miles and years, his hands still shake and his voice trembles. Then he broke out of it one day and came over here with his wife and young son. Then began peace and recovery. He is a happy man, and his wife and children thrive…No boxes of gifts are carried up to Wittmer’s house [as they are to the Baroness’], but it is perhaps therefore that his eyes are calm and his children happy. He drew in at his pipe while his children played with a Shepherd dog puppy, and his peace is comfortable." "When Ritter and the Baroness have broken each other down to the level of the ground, when Paradise and Eden have gone down to smoking Hell, Wittmer will still be sitting outside his little comfortable house, sucking his pipe." *Excerpts from “Monsumens Reise”, H. Mielche. Translated by Miss Deichmann. 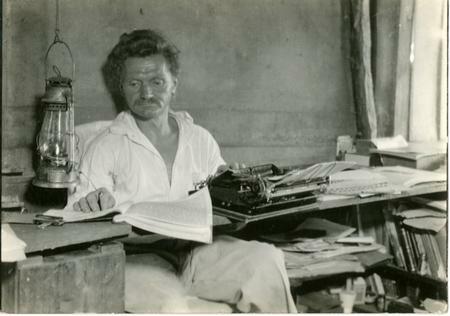 Waldo Schmitt Papers, RU 7231, Box 88. In our next and final installment: bodies are found, and tragedy strikes Charles island.